Your search is over! This fifth wheel toy hauler has everything you need and want when traveling to an off-road park, a state campground, and a local trail ride. 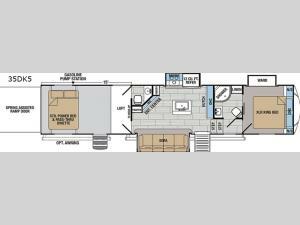 Beginning with the separate garage offering 15' of toy hauling space, a power bed and dinette, plus a loft above, and a convenient half bath, this toy hauler is perfect. You can enter the main living area to rest on the large sofa slide through the cargo interior door or the main exterior entry. The cook will love the kitchen island and spacious area with dual slide outs and a hutch. When you have had enough excitement for the day, you can retire to your own private master bedroom with access to the full bathroom. Join the fun today!